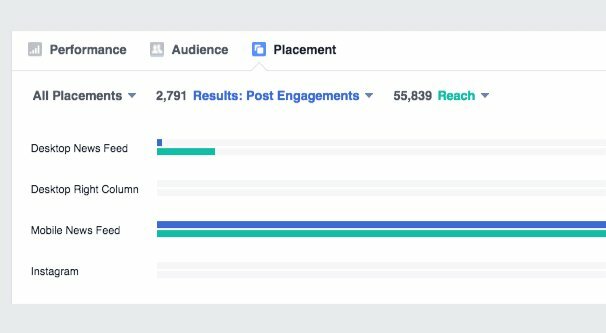 Boosting posts is meant to be Facebook’s way of encouraging advertising through organic success. Basically, it’s a quick and easy way to turn an organic Facebook post on your page into an advertisement. The copy is already there, right? The audience can carry over from the people already engaging with it, in a lookalike audience fashion. It seems like a slam dunk. Facebook uses the boost post feature as an upsell, essentially. Whenever one of your posts does well, they’ll encourage you to boost it to get even more out of it. They want to capitalize on any post that goes viral, so they can get you to spend money, under the assumption that more of that viral success will be better for you as well. The problem is entirely in how restrictive the boost post feature actually is. When you boost a post, Facebook makes an ad campaign using that post as the copy for the ad. Already we see problem number 1: the post is not optimized to be an ad. It may be going viral, but it’s not doing it because you optimized it for paid success. You can set general targeting options – basically just your audience and location, if this – and that’s another problem. Facebook’s ad system is successful entirely because of the robust depth of targeting options available to you. You can reach very narrow audiences you wouldn’t otherwise be able to see. Now, boosting a post to reach more people similar to the ones who are already engaging with it doesn’t seem like a bad idea. It’s not really a bad idea, either, except it doesn’t take things like conversions into consideration. How many times have you had a post go viral and gotten basically nothing out of it? I know it happens to me all the time. A viral post gets a lot of engagement, but very few of those people go on to follow my pages, and even fewer go on to convert into customers. When you’re boosting a post, the ad type is set to post engagement. Engagement-focused ads are fine, when you want engagement, but that implies that you can do something with that engagement. When you boost an already viral post, you’re getting more engagement to make it that much more viral, but again; what comes next? You’re spending money, but is any of that money going anywhere? Facebook today also has a problem with the proliferation of meme culture. What I mean by that is that people are used to saving copies of posts they like, to share with their friends later. It’s distressingly common when compared to just using the share button. Just browse, say, Imgur for a few days and look at all the phone-clearing meme dumps. How many of them have sources? How many of them do you know where the content came from? If you have a post go viral, a lot of people are going to be stealing your post and running with it for their own benefit. So I’ve already listed three problems: poor optimization of copy, poor optimization of targeting, and the lack of appropriate ad objectives. Is there more? Tell me there’s not more. Some problems you can fix if you know what you’re doing. Except, the boost post feature still restricts you from applying knowledge you may have from running your own advertising. First of all, you may think you can just set your own targeting options to better suit the people you want to be engaging with your post. Except, Facebook limits you to just interest targeting. You can’t use advanced targeting, and the behavioral targeting options are locked out as well. You’re basically limited to broad audience targeting of your fans and your friends of your fans, with a bit of interest targeting on top. This isn’t nearly enough, and in fact discards most of the real power of Facebook ads. You don’t get to mess with placement for your ads. Since you’re boosting an organic post, all you have is “a news feed post” as placement. You can’t control anything separately for desktop versus mobile, and there’s no way to convert it into a sidebar ad. 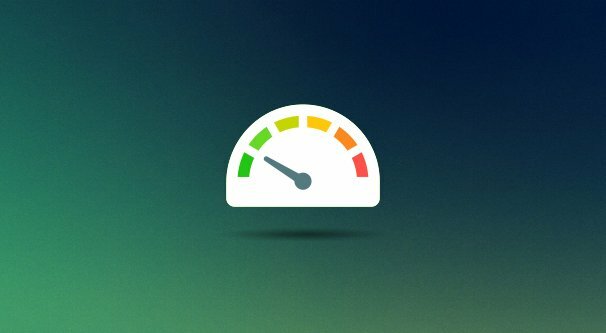 Boosted posts are also time limited. You can’t boost a post on an ongoing basis; you can only boost it for a limited amount of time. There’s also the fact that what works for an organic post might not work for an ad. In particular, what happens if you post an image that is mostly text and that image goes viral? You boost that post, and Facebook immediately squashes it because of their text limitations. The old 20% text rule is gone, but they still penalize posts with too much text in them. On top of all of that, you’re still limited to just reach-focused post engagement objectives. Even if you wanted to run the post as an ad to focus on conversions, or even website clicks, you can’t. 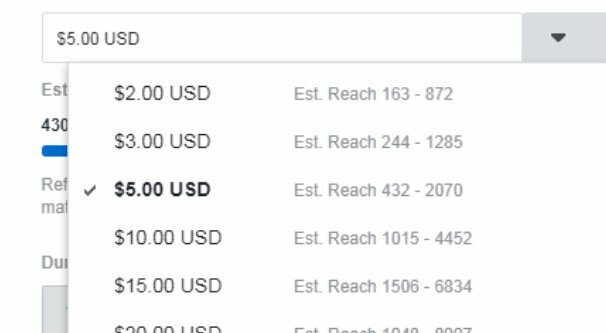 All a boosted post does is serves to let you give Facebook money. You’d think with an ad that is explicitly focused on getting more people to see it, that you could at least do that. When you boost a post, Facebook gives you an estimate of the number of people who may see the post. 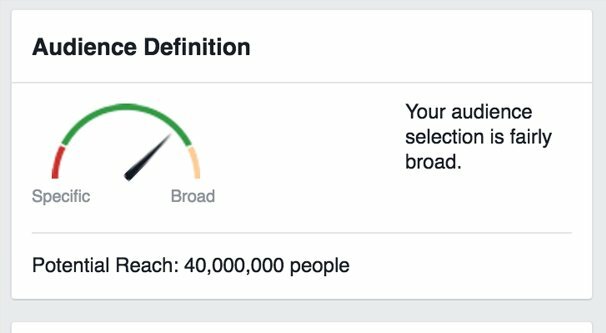 It can be a pretty broad range – the example Facebook uses in a screenshot in their help center is 3,900-10,000 people. For a lot of businesses, there’s an entirely different world of success as the difference between 4K and 10K people. Even if you run a boosted post campaign for its full duration, you may not get even that much exposure. Imagine being told your ads can reach between 4,000 and 10,000 people, running and paying for them for a week, and getting only 2,000 new engagement actions. Is Facebook lying to you? 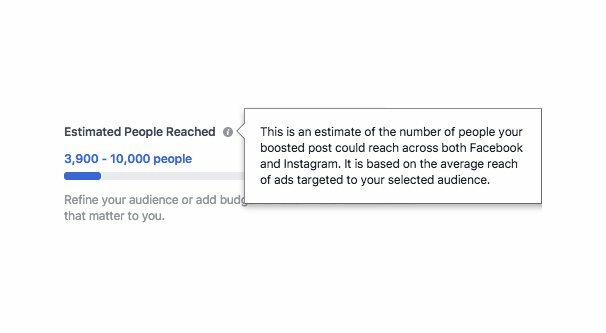 See, Facebook’s projected reach for a boosted post is an estimate. That’s why it’s a range. It’s not even necessarily a very good estimate. If someone else has a similar audience to you and they’re running really bad boosted post ads, those ads perform poorly, and that impacts YOUR boosted posts. Similarly targeted ads don’t perform well, so your reach will be lower. 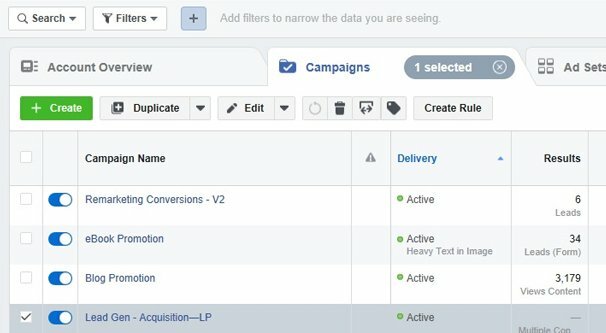 In fact, Facebook explicitly says that “estimated reach is intended to help you figure out how much you want to spend on ads and isn’t intended to be a prediction of how many people will actually see your ad once it’s running.” In other words, it’s basically just a lie they tell you to get you to spend money. The usual ad problems come into play here as well. Competition means a smaller budget doesn’t go as far. The size of your audience means the low hanging fruit is picked earlier so it’s harder to reach more people for lower costs. The “quality if your creative” can play a role, but again, you didn’t optimize your organic post to be an ad, it just ends up that way when you boost a post. Essentially, Facebook’s own ad systems are working at odds with their boosted post feature. It just fights itself, hurts itself in its confusion, and leads to you spending more than you wanted for less than you hoped to get. There’s more at stake than just losing your money, though. Unfortunately, boosting a post can actually hurt your organic reach for some time afterwards, and it all comes down to how Facebook’s sorting algorithm works. Organic reach is pretty low in general on Facebook. A few years ago, it was somewhere around 6-7% of your audience. Today, it’s closer to 4-5%. That seems pretty dismal, and it is. It’s also not because Facebook is trying to scam you out of money. The cause of low reach is generally just because of the sheer press of content on the site. There are billions of people on Facebook, and millions of brand and business pages, all of which are posting content constantly. Only a tiny fraction of that content is in your immediate circle, sure, but even among that circle, more content is being posted than you can consume. One old estimate was that an unfiltered feed would show the average user something like 3,500 posts per day. That’s cut down by 90% by the algorithm, just to make the platform usable. Boosting a post seems like the solution to this. Pay a bit, get more reach, and rake in the benefits. Well, that might work, if you only reached your audience, and you only reached the people who actively engage, and no one decided to flag your ad as something they’re not interested in. Unfortunately, that’s never the case. There will always be a few people who don’t want to see your ads and mark them accordingly. There will always be un-engaged users who see your ads and ignore them. There will always be people who may even enjoy your post, but don’t care enough to engage with it. All of these are signs of a poorly performing post, and they all tell Facebook that maybe your posts aren’t quite as good as you thought. This leads to them decreasing your reach on average, since you’re not as engaging as they want you to be, even though the reason is because you’re paying to reach an expanded audience of less engaged users. Your own boost posts hurt future reach. 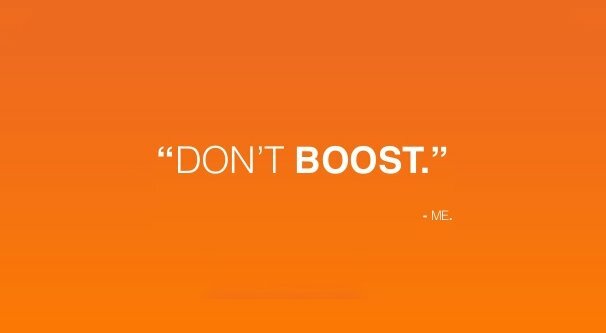 So instead of using the boost post feature, what should you do instead? Well, you have a lot of options. I recommend running actual, real Facebook ads. Even if you want to boost a post, just copy that post as an ad in the ads manager instead of hitting the boost button. You’ll have far more control over your potential audience targeting. You’ll be able to reach more people for a lower price, and you can even use ad objectives like website clicks or conversions that can get you far, far more benefit out of your posts. Plus with real ads, you can do things like split test, for even more future benefit. Alternatively, you can simply ignore the paid aspect of Facebook entirely. Ads aren’t strictly necessary to success on the site, they just help to pave the way. You can still do just fine organically, hard as it may be. And if you’ve boosted posts before and you’re suffering from the aftereffects, you have options. A few real ads with narrow targeting can bring your organic reach back up. A purge of the worst bot followers you can find is not a bad idea. Maintaining good, positive activity is always good, and understanding your audience is crucial. Nail down the basics, run some decent ads, and make out like a bandit in comparison.